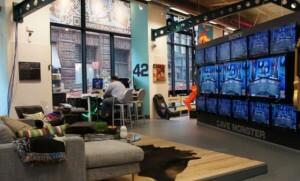 The ‘Inside the MLB Fan Cave’ blog by Sony Electronics was published the day of the 2011 MLB All-Star game. Mike and Ryan were hired to watch every MLB baseball game at Fan Cave and are living in New York full-time during this entire season. The Fan Cave is a premier Sports Techie crib. Watching the All-Star game or any other baseball game there must be aces. Both the MLB FanCave: @MLBFanCave and Sony Electronics: @SonyElectronics are connected with Sports Techie on Twitter. Very thankful for the Twitter follow back. I enjoy your tweets. Visit the guys at www.mlbfancave.com. They are using the Sony Bloggie gadget to help capture exclusive content for their blogs. Interacting with the Fan Cave tower of Sony TVs or what is known as the ‘Cave Monster’ is as good as it gets for any Sports Techie. Enjoy the 2011 MLB All-star game wherever you are and with whatever electronics you happen to be using. Let this years MLB Fan Cave dwellers know you care and follow them on Twitter. You can also engage with them by Liking their Facebook fan page here: http://www.facebook.com/MLBFanCave. I love being Sports Techie, especially with the MLB Fan Cave and Sony Electronics of the world making it happen for all of us via Social Media and Technology.